Applets in the Scripts menu are now launched rather than run by the system script runner. Fixed a crash that could occur when closing documents on Macs with Touch Bars. User canceled errors in scripts run from the Scripts menu will no longer result in error dialogs. Fixed regression in display of linebreaks and tabs in results explorers. Corrected regression where opening a script library via the Open Viewer command when the Open In Tabs preference setting is enabled results in a new window being created. Text selection range is restored when opening a script in a new tab. It is now possible to change the current tab via scripting by setting the current document property of the script window object. Addressed a crashing bug that occurs when AppleScript begins returning the errOSAInternalTableOverflow error. Several changes have been made to the way script documents are opened, particularly when opened via a script. When opening a document via script, the command will return as soon as the document is open, and not after a 5 second delay. The open command will return references to any script documents opened, and if the command specifies script dictionaries, reference to the dictionary windows. If you open several scripts’ dictionaries at once via scripting, the first will open in any existing dictionary window or a new window, and the rest will open in separate dictionary windows. When you try to open a document via a script and there is an error - for example, if the script was saved run-only - the error will no longer cause a modal dialog to appear in Script Debugger, but will instead be returned just as a scripting error. This means you can now wrap opening documents in a try block. If a script document has a scripting definition file, you can now have both the script and the dictionary open at the same time. Scripts targeting Script Debugger will require explicit tell blocks. When scripts are running, you will see the small spinning gear in the menu bar that you see when running scripts from Apple’s Scripts menu. 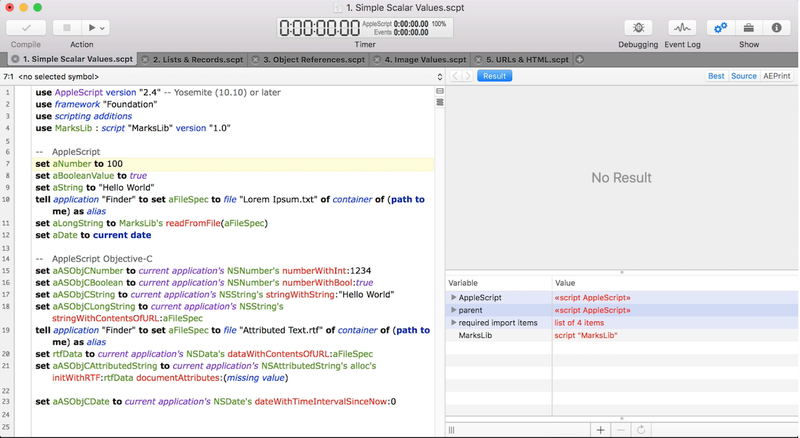 Any use of Apple’s progress properties will display in the same area. Script that try to use AppleScriptObjC to modify the host’s behavior will have no effect on Script Debugger. Scripts with crashing errors, especially AppleScriptObjC errors, will no longer crash Script Debugger. Running scripts that open documents in Script Debugger will no longer generate spurious timeout errors. Next story 4K Video Converter 5.1.35 – 4K UHD Movie Converter. Previous story MacBreakZ 5.32 – Reminds you to take periodic breaks from your projects.